It can become tiresome writing, and I’m sure reading, about fake gold Omega cases all the time, however, when a new batch begins to show up in faux 14K gold, it’s in the interests of Connie aficionados to know exactly how to spot them. Click on this listing and see if you can determine why it can be asserted that this is a fake cased pie pan Constellation. While I am not suggesting that Alex knowingly listed a fake gold-cased Constellation, I am asserting that the case was not sourced by Omega, was not assayed by the Swiss assay office and was not manufactured by any known case manufacturer associated with Omega. I do assert however that Alex should have cancelled the listing and looked further into this matter when he was alerted to the fact that it may be fake. Alex’s explanation above is not sufficient to convince us that the watch is genuine. His remarks about different copper hues of parts is totally incorrect. Omega went to great lengths to ensure that parts lots making up chronometers were kept together and electroplated together in specific batches of copper/beryllium so as to ensure that its movements contained parts all of the same hue. So, it is a reasonable conclusion that parts not original to the movement have been employed. I do not see any evidence of proper gold testing having taken place. There are no tell-tale tiny drill sample marks on the case or specific sample scratchings and so I can only conclude that if Alex had the watch tested, it was probably with a non-invasive portable tester that employs an electromagnetic molecular process using electrically charged metal plates. Unfortunately such methods would not accurately reveal if the watch case was solid gold. For that you would need X-ray fluorescence or traditional sampling and testing methods. So, I am sticking with my assumption that the case contains minimal traces of gold until proven otherwise. That's 3000 Pacific Pesos (AUD) of rip-off right there. Purchaser of that would certainly feel mightily p*ssed off on discovery. Yes I'm kinda hoping that the seller will reflect and offer a refund to buyer. The seller has good feedback and I'm thinking that he'll opt for that course once he is satisfied that the watch he was selling was a fake. "- We can not guarantee an 100% authenticity for each and every part of not new second hand's items, if the other is not stated in the listing, please check all the details before put a bid. "It's an "out" saying Caveat Emptor, or let the buyer beware. IMO, the buyer will have a real tough time reversing this deal once the money has changed hands, unless eBay forces the seller to disgorge. This particular seller has a long history of selling bogus Frankenwatches over the last 5 years. In fact, he was suspended from eBay for several months under his previous ID "surgutyanin" for selling bogus watches. I don't know why they ever let him come back. Mind you, my 'shadow' completely agrees with you! Wow, yes I remember the handle of surgutyanin and the trail of disaster he left. Lets keep a sharp eye on him eh? Thank you for providing a continued education for most of us who are learning about Omega watches. A basic question - does the case number inscribed inside the removable back define anything about the dial appearance and features? If not, what does the case number define, and are dial styles defined with other numbers? Sometimes a case back number will define, eg where, say, you see the case number 168.005/6 in a solid gold Connie, the/6 denotes solid gold dial deluxe model. Generally the case number allows you to match it on the Omega Vintage Database (although these days one often has to add another 0, as in 168.0006) The database will tell you the calibre, the case style (often there is a reference pic) and other details of the watch - generally enough to authenticate case and calibre. 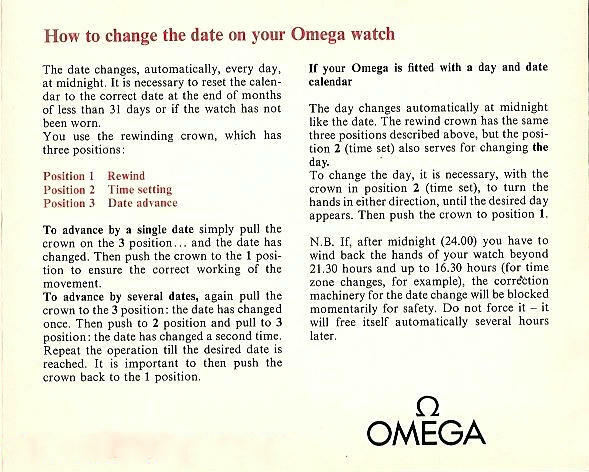 To fully authenticate, say, a case number with calibre and movement serial number, so as to ascertain that case, dial and specific movement left the factory together, it is necessary to pay 50CHF and get an extract from the Omega archives. Dial styles generally arent defined, but in certain instances the database will show that a particular model only came with a piepan dial.....but in most instances the case numbers (model numbers) featured a range of different dials. Just started collecting Omega watches and really appreciate this forum. Thank you Desmond, I've learned tons from your articles - perhaps I could suggest run a weekly competition, just for fun - a sort of constellation masterclass - spot the fakes on ebay... my entry this week would be item 120419180103 - am I right? A complete Frankendog. Wrong case back, fake dial with a printed star, cruddy rusted movement. Xitlali, the ebay seller describes this piece as "A very scarce and beautiful time piece, your investment in this watch will never go down in value"
I think the good xitlali needs to go and take an undergraduate course in aesthetics, because beautiful it aint. IN terms of the claim that it will never go down in value.....well if you paid $50 USD for it it most certainly wouldnt! I think Alex's reasoning is pretty solid: "I'm not an expert for Omega watches" but I paid pretty big money for it, therefore it must be genuine. I have looked at is feedback and there's no entry yet for the watch in question...he may have done the right thing after all. Vlad, the gall of them. Love your acier inoxidable story! I believe a couple of subscribers reported the sound-of-time listing and so eBay may have interceded with a bit, no, a lot, of luck. Hello Desmond: to further our education, could you examine eBay item 260418437485? The case back lettering seems amateurish and the dial face appears new, for a 1960 watch. yes you spotted a redial. The job isnt bad although the minute index should probably be either further in, or more likely at the very base of the markers, which means the hands have been replaced as well. The T Swiss T is incorrect as both hands and markers are not lumed. Movement looks clean and its the correct calibre for the case. The case back appears to be correct. As the case gets stamped at various times during it journey to the Omega factory we often see uneven stampings. I did an essay on Gold Omegas and you can click thru on LH column. Thank you Desmond for confirming a re-dialed watch, which looks pretty good. The lettering on the case back looks uneven, distorted and low quality (especially the "Omega Watch Co"), so I thought this was an Oriental reproduction. However since I've never seen (yet) genuine case back examples I have no basis for comparison. I'll keep watching your postings and looking at auction pictures, to keep learning ... until I might try buying a Constellation. Can you accept an email with pictures of 2 family Constellations, to identify? I get over 100 emails a week and try to respond as faithfully as possible. Hello Desmond: Sorry to trouble, i've read your essay on gold constellations but i found this: 220432178720 one hard to determine if real, franken, or completely fake. The case number and movement seem to match up on omega's database. Most signs lookg good. The dial is an obvious refinish which seller states upfront. I'm not sure of the perlage and the squirrel though. Do they look right to you? What's your opinion on this one? I'm travelling at the moment with my mini computer and so its hard to get a good look at the case back. the squirrel looks ok and there appears to be a assay office mark at the back of its head but I cant tell exactly. Really need to check the serial against a good chart. I cant make it our is it 12 or 13 million? For a 2648 I'd be looking at a late 12 million number. Now the second thing about this dial is that the watch being 14k one would expect this to be a 'no-name' connie with just the star and no-name. 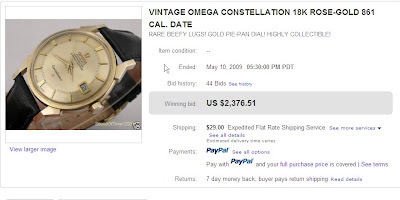 Most of these 14k went to the states and Omega wasnt allowed to use the Constellation name util 2956. So I think theres a real probem with this dial.....not a good refinishing job and most likely incorrectly printed with Constellation. Funny thing is that the original guilloche dial with the Connie name would make this watch worth considerably more. These guys sometimes just dont get it. My dad has a 1960's Omega Constellation white gold watch which he wants to get valued. Could you help ! Very difficult to value watches electronically. Better to take to a registered valuer if you want a valuation for insurance purposes. Otherwise check out the complete listings on eBay as they are a good source for gaining an approximate value. 1st let me thank you for the great work you have done and shared with internet community! Trying to follow all of your advises, I have bought myself a truly nice late 60s gold conny with diamond dial. Somehow I'm infected by the conny virus (my wife hates me for that). For some time I've watched a listing on German eBay for a nice 14k conny with an exceptional dial. Its pricy but I would appreciate your comment about this - to my mind - exeptional example. I have had a look at this one, and believe two things: First it is much too expensive for a 14k model 14381 Constellation. Second I am not convinced about the dial. I would need to examine a closeup of the script as this dial looks 'Conserved' and some of the painted hours markers do not match up properly with the applied hour markers. A 14k 14381 with good dial is worth around 1800 - 2100 USD in a good market. Desmond, spotted this unusual Manhattan cal. 1109 with display back and no claw screws. Is it legit, fake, or franken? Yes, looks kosher to me. This is the 368.1075 that was the replacement for the original 368.0865. This one has the cal 1109 instead of the 1111. Have 368.1075 with claw screw ? or it is without ? I found in Omega Parts Catalog it has Claw no. 189 0032 and this ref. no. doesnot have screws. Any help with identifying the authenticity of this watch would be appreciated. Everything looks ok. But I would ask to see a pic of the movement so as to confirm the 24 million serial number on the papers. Only issue I can see is that it doesn't have the Observatory medallion on the outer caseback. It could have been produced as a presentation watch. Inner markings look genuine for a 14k example. Dial is original and case looks reasonably sharp. So, it's a matter of you making a choice of gaving an example without the medallion.